The cooling benefits of energy efficient ceiling fans in summer are widely understood, however ceiling fans are also useful in creating a comfortable environment in winter. They do this by evenly distributing warm air around a room. Quality modern ceiling fans also include a ‘winter mode’ to prevent the cooling draft that is so useful in summer. This problem of cool air on the floor and warm air on the ceiling is easily solved by turning on your ceiling fans in winter. All quality modern ceiling fans have a ‘winter mode’ that reverses the direction of rotation of the ceiling fan, preventing the cooling draft that is so valuable in the hotter months. It does this by drawing air up to the fan from the middle of the room and then pushing it out along the ceiling and then back down the walls, gently mixing the air. 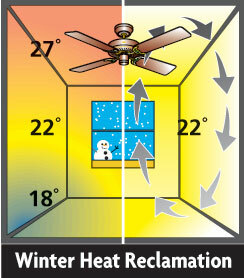 All good modern fans have a ‘winter mode’ that reverses the fan’s direction of rotation. Usually this is a switch on the hub or motor housing of the fan. Better fans will inset the switch so that it doesn’t detract from the styling of the fan. When running the fan in winter it is nearly always best to run it on low speed. All you are trying to achieve is to gently mix the air without creating a draft. The exception to this is when you have a particularly large space and vaulted ceilings. An additional benefit of the recirculation of the air around the room is that air is less prone to stagnate against the windows, where it cools and then sheds its moisture content onto the window. This has the double benefits of reducing window condensation and increasing the humidity of the space, helping to limit the dehydrating effect on your skin of cold environments. may other factors. However regardless of your situation it is nearly always more energy efficient to redistribute already warm air using an energy efficient ceiling fan than heating more air to raise the ambient temperature within your home. The NSW Government runs a "black balloon" advertising campaign which tells you how you can reduce your energy consumption, including the use of a ceiling fan in both summer and winter,.